As a vice president and chief intellectual property counsel at TESARO Inc. and an accomplished dressage rider and sport horse breeder, she knows more than a few things about conquering individual challenges and stacking those wins together to accomplish something major. She began working at TESARO in 2016, but her career in intellectual property (IP) began long before that. In fact, Tousignant’s extensive background in the biotechnology space, including in IP, coupled with her passion for dressage and sport horse breeding lends her a unique perspective on the biotechnology and pharmaceutical industry. Tousignant’s decision to begin a career in the sciences was inspired by an early experience with one of her mother’s preschool students who was living with cystic fibrosis. Her experience in lung biology research as part of her undergraduate studies in chemistry led to her first position in the biotechnology industry at Genzyme Corporation (acquired by Sanofi in 2011). Following successful research at the bench and as an inventor on several patent families, Genzyme’s legal department recruited Tousignant to focus on IP law. “Because I worked both at the bench and then in-house at Genzyme while I went to law school, I learned the business from the inside, which gives me a wonderful, bottoms-up perspective. I understand the business of science is the process of bringing new drugs and treatments to the market all the way from the research lab to commercial,” she says. Tousignant’s career and understanding of IP is also informed by her passion for horses and her extensive experience with competitive riding in dressage and sport horse breeding—all of which involve plenty of day-to-day decisions that combine for positive and noteworthy results. 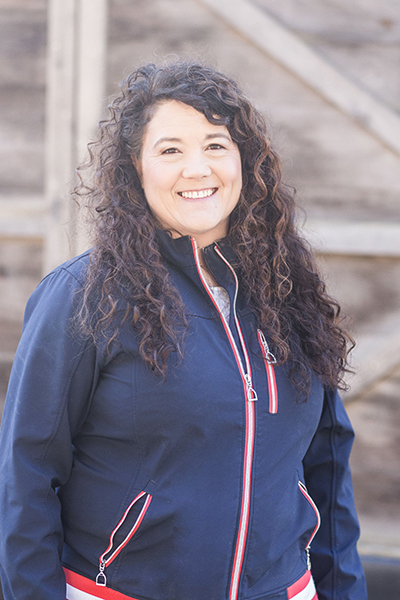 After graduating from the University of Virginia and launching her research career at Genzyme, Tousignant started riding at Apple Valley Farm. Apple Valley specialized in dressage—an equestrian sport that requires a highly skilled horse and rider to perform a series of carefully choreographed movements. It was there that she met her mentors and began her dressage practice seriously, which led her to eventually open her own breeding farm, Rhodes Farm. “Dressage is amazing. It’s an incredible feeling to be that connected to your horse, a twelve- hundred-pound animal, and to be able to to direct the horse through a ride. It’s a sport that requires a uniquely complex combination of theory and athleticism,’’ she says. Her work at TESARO isn’t all that different from breeding dressage horses, she says. Tousignant joined TESARO to build the IP department from the ground up, and the company recently was acquired by GlaxoSmithKline. Intellectual property in this field is particularly complicated due to the competitive nature of the space and the use of therapeutic combinations. “IP practice in this area requires understanding not only your own products, but also the competitive landscape—both in a very granular way and on a high strategic level.” she says. Her department’s long-term strategy is to embed IP into the business so that it is integrated it throughout the entire research and development process, including education of the entire business in a way that makes the entire company stewards of its IP. Dressage riders have the goal of strengthening their horses while developing the horse’s talent through different levels of competition in the sport. Champion dressage horses are bred to have three pure and expressive gaits, athleticism, and good characters. Rigorous breeding standards and classical training combine to make a successful horse and rider team. Dressage riders train for years—both in riding as well as in course-based and practical judging training—to achieve the riding scores and pass the tests they need to become qualified as judges.